At the Royal Military College of Canada's SLOWPOKE-2 Facility, a neutron radiography facility has been designed and installed using a small (20 kWth), pool-type research reactor called the SLOWPOKE -2 (Safe Low Power c(K)ritical Experiment) as the neutron source. Using this Facility, numerous unique investigations of metal ceramic composites and aircraft composite flight control surfaces have been carried out. In this paper, the results of the inspections of the flight control surfaces of the Canadian Air Force's CF188 Hornet aircraft will be presented. After reaching a predetermined number of flight hours, aircraft in the Canadian Forces are usually selected for an Aircraft Sampling Inspection (ASI) program. ASIs are inspections carried out in order to gather data to make decisions on the content of the aircraft's preventive maintenance program, and consist of systematic disassembly and inspection of representative aircraft at a depot-level facility to locate hidden defects, deteriorating conditions, corrosion, damage due to fatigue or overstress, and any other deficiencies in the aircraft structure or systems. After a successful inspection of the highest flight-time CF188 aircraft at McClellan AFB and at the Royal Military College of Canada (RMC) using neutron radiography (which located a total of 93 anomalies), a decision was made to inspect all flight control surfaces of the first few CF188 ASI aircraft with neutron radiography. The flight control surfaces were removed from the aircraft at Bombardier, and then routed to RMC. Once the components were received, approximately 150 neutron radiographs per aircraft were completed and analyzed in order to locate any areas of corrosion, disbond, or impact damage, any foreign objects present, and any areas where previous repairs were not carried out correctly. The use of neutron radiography is especially well suited to locating areas of corrosion and moisture entrapment, and many of these areas have been identified on the flight control surfaces examined to date. Therefore, this paper will give an overview of neutron radiography and its unique applications, and then present the results of the inspections completed on the CF188 ASI aircraft. Neutron radiography is considered a complementary nondestructive testing technique to conventional radiography. In x- and gamma radiography, attenuation increases uniformly with mass number and density, whereas, with neutrons, attenuation is random with a tendency for certain light elements such as hydrogen to absorb and scatter neutrons rather well. Thus, neutron radiography is especially well suited to detecting corrosion and moisture entrapment, especially in aircraft structures. For practical neutron radiography, it is necessary to have access to an intense source of low energy neutrons. Neutrons can be produced from either accelerators, radionuclides, or nuclear reactors. Although the first 2 sources may offer some measure of transportability, often their neutron intensities are too low and their energies too high for thermal neutron radiography. While significant gains are being made using these neutron sources, at RMC the availability of a small, relatively simple, and inexpensive research reactor, the SLOWPOKE-2 made the selection of a neutron source obvious. Before installation of the reactor in 1985, a thermal column of heavy water was installed to provide a pathway for thermal neutrons to travel from the core region radially through the reactor container. At this point, the bottom end of a beam tube containing a shaped piece of graphite and an aperture was placed in order to extract a beam of neutrons upwards (Figure 1). Many additions and modifications to the shielding, lining and aperture have taken place since the original installation in order to produce a neutron beam adequate for neutron radiography. [W.J. Lewis, L.G.I. Bennett, "Improving The Beam Quality Of the Neutron Radiography Facility Using The SLOWPOKE-2 At The Royal Military College Of Canada", NIM A377, 41-44, 1996]. As part of the ASIs determination of the structural integrity of the CF188 aircraft, it was decided to inspect an aircraft with the highest flight hours using both x- and neutron radiography. On November 6, 1995, CF188733 arrived at McClellan Air Force Base (AFB), and was initially inspected with the Maneuverable X-ray Radiography System (MXRS). After 2 weeks of both real-time and film radiography, the aircraft was moved to the Maneuverable N-ray Radiography System (MNRS). The programming, real-time inspection, and film radiography (for those areas that the robot could not access) were repeated in the neutron radiography bay. As well, additional film radiographs were made of those areas of interest where the real-time neutron system indicated significant or extensive anomalies. 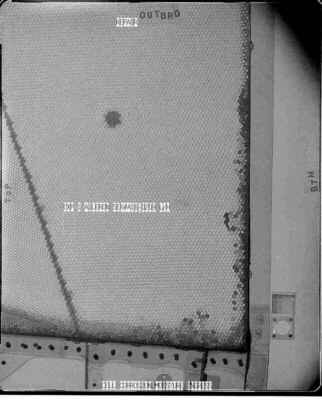 The neutron radiography completed at McClellan AFB revealed 93 anomalies, including moisture, cell corrosion, damaged honeycomb core, foreign object material, voids, and repaired areas. Some of the panels inspected contained multiple anomalies. The anomalies were, in general, small and the aircraft was in generally very good condition. [Non-Destructive Inspection Report, Canadian Forces CF-18A, Vol. 1 & 2, USAF Sacramento Air Logistics Centre, McClellan AFB, CA, 1996]. After returning to Canada, the component with the greatest structural significance, namely the right hand rudder from the vertical stabilizer, was removed from the aircraft and put through a rigorous program of numerous NDT inspections, including x-radiography (film and real-time), eddy current, ultrasonics (through transmission and pitch-catch), infrared thermography, and neutron radiography. Of all the techniques investigated, only through transmission ultrasonics and neutron radiography were able to identify large areas of hydration, and only neutron radiography could identify the small areas of moisture entrapment and hydration. Finally, the rudder was disassembled to destructively determine the levels of moisture and entrapment. All areas of moisture entrapment and hydration found during this disassembly were the same areas that had been detected using neutron radiography. As a result of these investigations, a total of 8 CF188 aircraft will have all flight control surfaces inspected with neutron radiography and through transmission C-scan ultrasonics. To date, 3 complete aircraft plus some additional components have been inspected. After the inspection of the complete aircraft at McClellan AFB and the repeat neutron radiography of the rudder at RMC and its destructive testing, the inspection of the first 3 aircraft commenced. Both neutron radiography and through transmission ultrasonics were utilized, in addition to an initial inspection at the depot using x-radiography. The indications by neutron radiography for all inspected flight control surfaces from these three aircraft, together with the rudders from the other two aircraft inspected at McClellan AFB and RMC, are summarized in Table 1. The values in this table indicate the number of anomalies detected, and are not an indication of the severity of the indications detected. The column headings indicate the flight control surface inspected and the types of indications are grouped, with the more significant indications of moisture and corrosion listed above the less serious indications. The suspect areas indicated in the table are most probably areas of corrosion. By way of illustration, Figures 2 and 3 are digitized positive images of neutron radiographs. Figure 2 is a copy of the neutron radiograph of the hinge attachment area of the leading edge outboard flap removed from aircraft CF188729, completed at RMC. The radiograph clearly shows areas of moisture entrapment and the absence of cell walls due to corrosion. 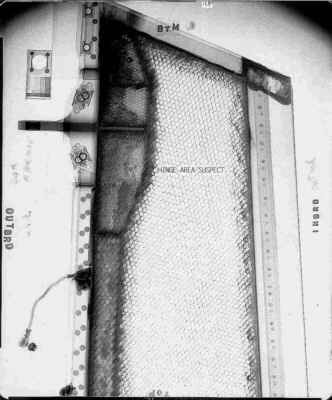 Figure 3 is a copy of the neutron radiograph of the left hand aileron from aircraft CF188912, also clearly indicating areas of moisture entrapment and cell corrosion. Other moisture and corrosion indications found by neutron radiography included moisture in repaired areas where sealant had been injected, blown core where water may have frozen and expanded, voids in the sealant of repair patches, inconsistencies and porosity in the original sealant, repaired damage in the honeycomb, and foreign object debris (FOD). Of the 57 indications, 37 (or 65%) are due to moisture and corrosion, as summarized in Table 2. Again, the severity of each indication is not indicated, as this determination has yet to be finalized. There are a larger number of indications for the leading edge flaps (LEF) and the trailing edge flaps (TEF), compared to the rudders. However, when the areas of the indications are taken into account, it is suspected that the rudders will have the greatest structural degradation. In summary, neutron radiography has been used successfully to indicate areas of moisture ingress, honeycomb cell corrosion and adhesive/composite hydration in CF188 flight control surfaces. Using initially the MNRS at McClellan AFB, and then continuing the program using the SLOWPOKE-2 at RMC, 3 complete aircraft plus additional components have been inspected, and approximately 300 neutron radiographs have been made and analyzed. Of all the flight control surfaces inspected, a preliminary analysis suggests that the rudders have had the greatest structural degradation. Further analysis of the maximum allowable degradation for each of the flight control surfaces needs to be completed, together with inspections of a greater number of flight control surfaces to identify any trends that may be present. Therefore, an additional 5 aircraft will be inspected. The authors with to thank C.T. Kirby, P. Teshima and H.K. Wieland for their work on the beam tube. The radiography was performed by MCpl D.M. Miller, assisted at various times by MCpl R.C. Dillon and MCpl M. Thibodeau of the Non Destructive Testing Branch, ATESS, and Mr. O. Fransescone of QETE.